I am an assistant principal of a K-4 elementary school. I have taught grades 2nd-5th and served as an instructioanl technology coach for the district for six years. I am a NBCT, STAR teacher, and DEN teacher. I am also a technology adjunct professor at UAB Birmingham. I am currenlty working on my PhD in Educational Leadership and Instructional Technology Curriculum. After reading, Monkey with a Tool belt and the Noisy Problem by Chris Monroe, students were engaged in a learning activity that focused on sounds. In the book, Chico can not figure out what is making the “Arooga Boom Boom Clang Clang” sound in his tree house. He sets out to find the sound and ends up finding an elephant stuck in his laundry shoot. Students loved the problem solving and the introduction of a new character. Clark the elephant got lost and landed in Chico’s tree house instead of Elsa’s. The STEAM learning extension included content in making, music, art, technology and engineering. Third and fourth grade students used their Chromebooks to complete their projects. These classes created a sound using materials in the Maker Studio and recorded them on the app Mic Note. The process of going to the web store and adding an app to the drive was all part of the instruction. Students then learned how to export the sound and make the copied link shareable. This link was then placed in the QR code generator that they had downloaded. Once the QR code was generated, students copied the image and placed their finished product on the google doc located in the STEAM google classroom. Once QR codes were printed and cut out, they were placed on Chico’s tree house. Understanding the purpose of listening and how sounds are all around us encouraged students to place the QR code according to what room in Chico’s house he might hear their particular sound. Problem solving, learning new technology, creating and producing a product to share with the school at large was an exciting learning experience. When Everyone Wears a Lab Coat…. Everyone Feels Like a Scientist! Thank You Andrea Beaty for giving us, ADA TWIST, SCIENTIST! Last year, we introduced students to the author Andrea Beaty. Her books, Rosie Revere, Engineer and Iggy Peck, Architect were a focus in literacy and making for our school year (2015-2016). Students were exposed to a real Rosie and learned all about architects and engineers. At the end, our students participated in a SKYPE with Ms. Beaty. During our SKYPE session she revealed the release of her new book! ADA TWIST, SCIENTIST. This book was a HIT with students. Rosie and Iggy joined us for a day in the science lab. Students in grades k-4 participated in a reading of the book along with a science activity that Ada performs in her classroom with Ms. Lila Greer. “What is that smell?” was the question Ada was trying to solve. Watch and see the engagement and excitement of scientists in the making. Integrating management and motivation is a way to support the whole school culture. After reading, Monkey with a Tool Belt by Chris Monroe, we implemented a positive reinforcement opportunity for students. Using the idea of tools as a lead in from the text, we developed “tool badges” that can be earned based on behavior expectations school wide. These tools help us “build” character and “make’ good choices. Tools include, Routines, Responsibility, Respect, Safe (from our S3R’S district initiative) along with collaboration, listening, critical thinking and innovator. Students have several ways to earn the badges. In the Maker Studio they have grade level toolbelts to collect their badges in based on behavior during that special time. 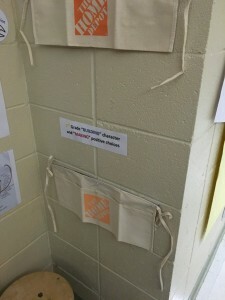 Students can also earn badges to place in their classroom toolbelt. At the end of the nine weeks the tool belt will be evaluated, “What is the value of your toolbelt?”. Each badge is a different shape and carries a different numerical value. 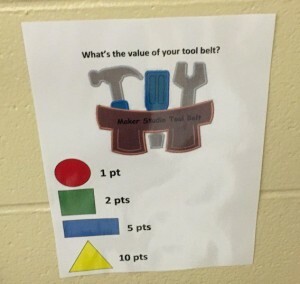 The grade level with the highest toolbelt value will get to choose from a set of predetermined incentives. Incentives for Maker Badges include “self-select” building/making or free build in MinecraftEDU. What is the value of your tool belt? **Grade level teachers can use the incentives however it works best in their classroom. Next semester we will explore digital tool badges. Routines: Students were so excited to have their first day back in the Maker Studio. As we found ourselves ready to enter, I was so excited to see the number of students that remembered the routines that were established last year. Routines, that students can follow from year to year, impact instruction time by affording efficiency in getting on task. All grades, second through fourth, demonstrated and shared the importance of having routines in place. Not only did they follow routines for entering and exiting the space, they also worked on the visible thinking routine to share their background knowledge. 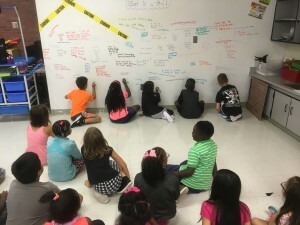 Students responded to, “What is a Tool?” by expressing their thinking on the thinking wall. 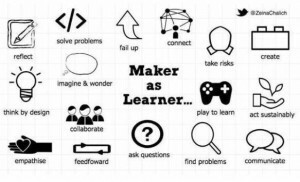 Responsibilities: As students began discussing the responsibilities that they would demonstrate in the Maker Studio, they were very quick to share the “why” behind the responsibility. It was not a set of rules but a personal expectation of responsibility for being safe and mindful. Student developed responsibilities provide ownership for both positive and negative experiences. Relevance: Behind every engaging lesson there is relevance. Teaching and learning that “looks” like play supports learning for all students. When the learning is relevant and purposeful, useful and applied students bring everything they have to the experience. “What is a tool?” was the launch of our 2016-2017 learning year. Students eagerly shared their thinking about tools and built their own excitement towards using the tools in the Studio. 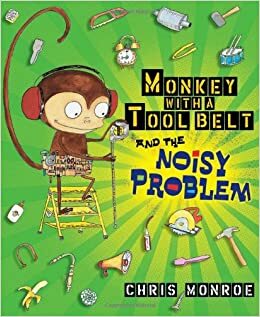 The literature link we used was, “Monkey with a Tool Belt” by Chris Monroe. This one book has set the stage for relevant activities for students in grades 2-4. Students have already made connections with the main character and are looking forward to the BreakOut session that stems from the story line. We are very excited to host the second annual EdcampSTEAM in Alabama. Come share, discuss, and learn about Science, Technology, Engineering, Art, and Mathematics. 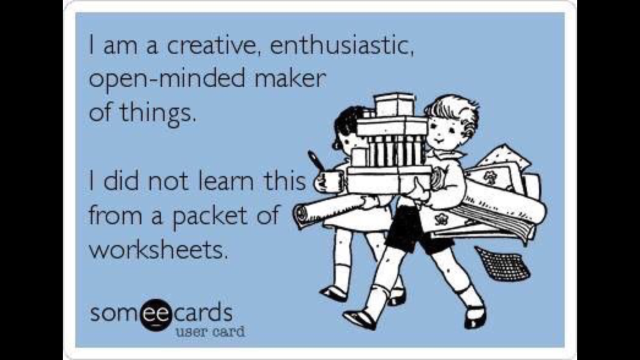 Join us in Respecting the A, the ARTs in the STEM model by sharing ways to build curriculum with technology, makerspaces, mixed media and crosscutting science concepts. The Atlanta Science Festival was a comprehensive arrangement of Science workshops, family activities as well as educator learning opportunities. Seeking professional development and living with a growth mindset sends us all over the country. Sometimes the opportunities are in your back door or neighboring state. Sometimes those opportunities are in the classroom next to you. With a variety of sessions and events, we had to map out what would be best for STEAM learning and collaboration. After driving for half an hour and ending up in a warehouse district, I must say we were a little hesitant but then remembered some of our best learning has been when it was least expected. With only 5 cars in the parking lot and two hours ahead of us, we entered. At first glance it looked like we would know about most of the materials being shared but that is noreason no to seek intently. To listen. To Reflect. A conversation about plastic #6 and how use plastic and heat to create art reminded us of a project our art teacher just completed as a part of her curriculum andSTEAM participation. Several times this week the term “oldie but goodie” has been used in a variety of conversations. In a session on PBL, oldie but goodie technology resources were revisited. We don’t always have to replace something that is working or that serves a purpose. During this session on Makerspaces, The oldie but goodie motto was brought to life with the remembrance of “Shrinky Dinks”. 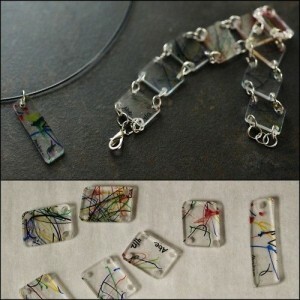 Jewelry making, badges and ornaments were all innovative ways to use Plastic #6 using the same heating concept with plastic as used with “Shrinky Dinks”. Fabrication of jewelry provides making opportunities that are completely student driven by individual artistic imagination. 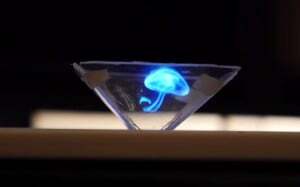 A final use of plastic in making was the 3D hologram. The 3D hologram uses an iPhone or iPad to project the image onto a folded piece of plastic that simulates a hologram. 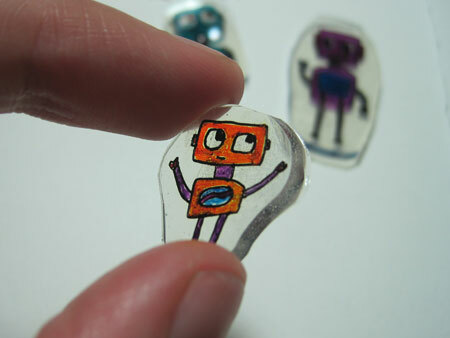 This is not a “Shrinky Dink” activity but uses recycled plastic to (CD cases , old transparencies, and I am sure your imagination can think of others) create a hologram effect. In addition, we learned how to make the videos for use with the plastic hologram attachment. This is another opportunity for students to use individual creativity to publish a final piece and communicate understanding. A great weekend of learning and bringing back. Thanks to all those that shared and learned with us. MinecraftEdu is a school-ready remix of the original block-building game, Minecraft. MinecraftEdu provides products and services that make it easy for educators to use Minecraft in the classroom. MinecraftEdu contains many additions to the original game that make it more useful and appropriate in a school setting. A cloud-based solution for hosting Minecraft classroom servers is also an option. This allows students and teachers access to connect and play together. MinecraftEdu hosts a library of worlds, lessons, and activities that are available for free. Edutopia: Edutopia gives some great ideas for using Minecraft in the classroom.Gamespot: Gamespot has a great article explaining why Minecraft could be a valuable tool in the classroom. How to Use Minecraft in Education: This site has an interview and podcast discussing the use of Minecraft in the classroom. Learn, Teach, Repeat: This teacher wrote a blog after I asked for feedback from teachers to help submit questions about Minecraft in the classroom. Thanks Joe! Minecraft at NCS: This teacher provides troubleshooting for users and gives ideas on how to run Minecraft more smoothly in the classroom. Minecraft Across the Curriculum: This site will give ideas language arts, drama, music, visual arts, science, geography and history. Minecraft Possibilities: This teacher provides some depth about plugins necessary to run Minecraft. Thanks John! MindShift: This is another great article emphasizing how teachers use Minecraft for educational purposes. Minecraft Wiki: This is a helpful guide for using Minecraft in the classroom for educational purposes. Mojang and UN: This site discusses how Minecraft is used to plan communities. Primary Minecraft: This site was set up by an elementary teacher and a Minecraft fan to provide ideas for primary grades. Swedish School: A Swedish school has made a class in Minecraft mandatory. They mention the following lessons learned: City planning; environmental issues; planning for the future; interactivity; safe online habits; computer skills. Curriculum Worlds – This site has great curriculum lessons for students at home or school. 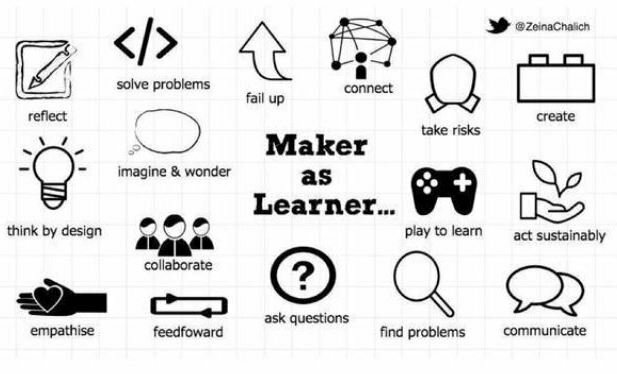 A Maker as a Learner thinks by design, problem-solves, plays with a purpose, and most importantly learns about FailingUP (Forward). What a great image!